Your aircraft is covered in various placards and decals. Many are required by your aircraft manufacturer, but others are purely decorative. Over time, these items tend to wear out, either due to sun damage or just due to age. Wouldn’t it be nice if you could replace these items without having to take your plane to your mechanic and enduring downtime? Good news…you can! I want to preface this by saying that I am by no means an expert at this, but for this blog, I want to show you how you can do your own vinyl decals. After buying our new aircraft, I noted three decal projects that I wanted to undertake. First, I noticed that the fuel placards that are near the filler caps were very much degraded and in need of replacing. Second, I wanted to add a new Piper logo decal to the tail. 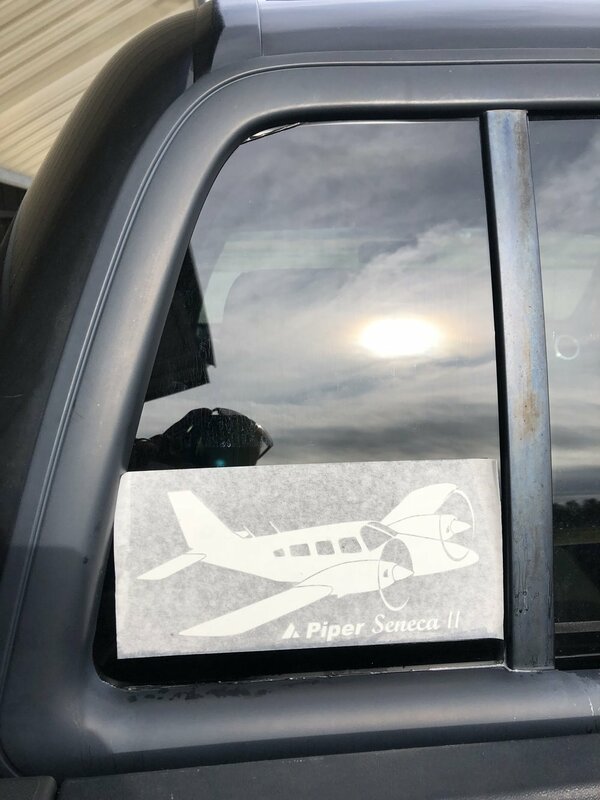 And third, I wanted to add a Piper Seneca decal to the back window of my truck. Okay, so that last one is not airplane related exactly, but the concepts are identical. For my projects, the vinyl decals came from two different places. The Piper logo decal for the tail came from Higher Graphics. This company specializes in decals for a variety of aircraft. The fuel placard and aircraft silhouette decals came from Custom Plane Decals. I became aware of this company from my PA32R days as the owner is a Lance driver himself. He has quite a knack for customs decals of all shapes, sizes, and colors. I highly recommend him for anything you need! Your decal(s). If you have a large sheet of decals, be sure to separate them into single decals prior to trying to install just one of them. A spray bottle with a window cleaner. I used Windex for my installs. This will be used to clean the surface that the decal will be applied to, as well as help you position your decal before setting it. A squeegee or a rubber roller. This will help to flatten the decal out, as well as help set the decal from the transfer film. A pin or sharp razor blade. This will help release any air bubbles that can develop underneath the decal while flattening it out. A roll of wax paper. This will be required to run the squeegee or roller over so you don’t damage the decal itself. Once you have all of these things gathered together, make sure that you find a nice, clean place to do your work. You don’t want it to be too cold and you don’t want it to be too hot. In fact, you’ll want the surface that you’ll be applying the decals to around room temperature. Lastly, wash your hands thoroughly. Even if you think your hands are clean, they may still have natural skin oils and other contaminants that could adversely affect how your decals go on. Now that we have everything and have found a clean space to work, we are ready to start the application process. The very first step is absolutely critical. You must ensure that you clean the surface where you will be applying the decal. If there is just a little dirt present, you can get away with a little soap & water or the window cleaner. If there is already a little glue or other adhesive, you might need a gentle solvent such as denatured alcohol or rubbing alcohol. Whatever you use, ensure that it will not damage the surface you will be applying the decal to. Regardless of what you use, make sure you clean off all oil, grease, and dirt before moving forward. Okay…so we have cleaned everything. Now what? Well, we start the actual application process by separating one quarter to one half of the decal from its backing. Do this slowly as sometimes decals have a nasty habit of separating from the transfer film. You’ll want to catch this prior to applying the decal without a portion of it. With a portion of the decal peeled back, spray the window cleaner on the exposed adhesive surface of the decal, as well as the surface where you’ll be applying it. Put the decal into position by using the backing to slide the decal around. Don’t worry, it should move fairly free. When the decal is in the desired position, press it gently into place. This helps to anchor the decal in its proper position. Once you have the first part of the decal where you want it, fold the remainder back to remove the rest of the backing. Spray this newly exposed surface with the window cleaner as you have before, and also make sure the surface where it will be applied is moistened as well. You can now lightly roll the decal against the surface fully, starting from the previously applied end. Do your best to roll out any air bubbles while properly positioning the entire decal. You should try to gently move the air bubbles to the edge of the decal if at all possible; however, if you find that you still have air bubbles underneath the material when it is pressed into place, you may need to use your pin or sharp razor blade to “pop” them in order to release the air. After letting it set for a few minutes, the window cleaner should start to dry. This is good, but you aren’t done with it yet. At this point, you can start to press the decal into place a little more firmly. This is where your wax paper and squeegee (or roller) will come into play. Put the wax paper over your decal while pressing with the squeegee (or roller). Reapply the window cleaner to the transfer film. This will help to release the glue from the transfer paper, and allow it to peel easier for the finishing step. The next step? You guessed it. Slowly start to peel back the transfer film, ensuring that the decal has properly transferred to your surface. You may encounter small pieces of decal that didn’t transfer like everything else did. Don’t worry. You can still finagle those pieces from the transfer film to your surface with the razor blade. Just carefully remove from one to the other, using more window cleaner if necessary. Once everything is in place and has dried, simply stand back and admire your work! Be proud of what you’ve accomplished, and start thinking about what that next project will be. Ahh…the joys of airplane ownership! !